As with so many of our clients, Jonathan and Lynn were in need of a fresh, contemporary site to showcase their fantastic facilities. With their old site showing its age and becoming difficult to maintain, commisioning an all new site to meet modern levels of both user experience and device compatibility was an essential and necessary investment. With several cottages available for hire, as well as a plethora of facilites and local area attractions to showcase, the new site needed to be rich in galleries and information yet easy for visitors to navigate and also simple for the client to keep updated. 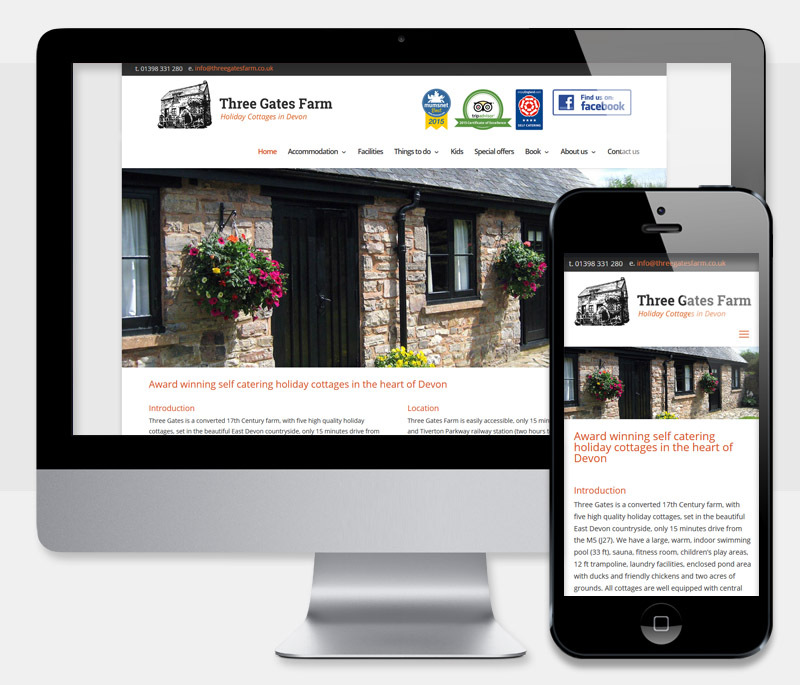 We designed the all new Three Gates site to be built on Wordpress. Additional branding work, SEO and social media integration ensures that the site maximises its traffic potential while the responsive layout and inclusive CMS trainining allows the client to keep the site maintained and relevant to all potential clients and on any device! We're very happy with our new holiday cottage website created by Peter and his team at Website Development. Having agreed a brief the site was built in a timely manner with excellent creative input from Dee and good communications throughout the process. We now have a bright, contemporary, user friendly website for our cottages which is surprisingly easy to edit and update with photos. Came in on budget too. Well done and thank you to Website Development.